Every student at NJSD will benefit from a school environment that supports social and emotional well-being to achieve his/her potential. To develop and strengthen policies, practices, services that promote learning and social-emotional well-being for all of NJSD’s youth through a collaborative process that engages schools, families and community-based agencies. 1. Develop relationships with the community that will promote collaboration and support for school mental health. 2. Demonstrate that mental health programs are necessary and integral to students’ academic enrichment and success in school. 3. Develop a Mental Health model that addresses the needs of the students, families and the Neenah community. 4. Develop standards and protocols to assure quality and fidelity of the interventions implemented. 5. Inform stakeholders about the progress and outcomes of interventions implemented. 6. Provide assistance and consultation that will improve the quality and capacity of mental health services at school and in the community. 7. Develop a report of existing initiatives and their success based on data reported on the Youth Risk Behavior Survey and other measures. 1. Social well-being is critical to school success. 2. School mental health programs are a shared responsibility of health and mental health agencies, schools, parents and the community at large. 3. School mental health programs should be strengths-based, student and family-centered, developmentally and culturally sensitive. 4. Families, teachers, students and other important groups should be actively engaged in the program’s development, oversight, evaluation, policy and continuous improvement. 5. All students will have access to the full continuum of school mental health services and supports regardless of ability to pay. 6. Coordination and collaboration with other systems of care outside and within the school is essential. 7. Programs and services should focus on a positive school climate, reducing barriers to development and learning, and be based on evidence of positive impact. 8. Quality assessment and improvement activities continually guide and provide feedback to the program. 9. Staff follow high ethical standards, are committed to children, adolescents, and families, and display an energetic, flexible, responsive, and proactive style in delivering services. 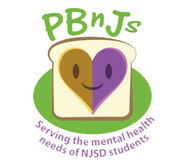 The PBnJ's fund serves the mental health needs of Neenah Joint School District students. Click for more information.